Fathers who have a job with long hours may need some creative parenting skills to find a way to have daily interaction with their young child. A child’s time with their parent can be a positive force in their ongoing development. 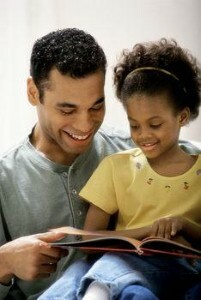 One way fathers can ensure this is by reading to their son or daughter at bedtime. When a father reads to his child at bedtime it can greatly impact that child’s academic success, specifically in their vocabulary development, according to Stephen Green who authored a study concerning the Fathers Reading Everyday Program. Aside from academic success, reading to a child can also enhance their imagination and inform them about the outside world. For younger children, it may be a good idea to start with the Harry Potter series, especially with the movies based on five of the books now out on DVD. After finishing one book, a father and his child can further bond by watching the movie together. Older children may appreciate a more adult-oriented book, which may include the Twilight series, which was also made into a popular film.